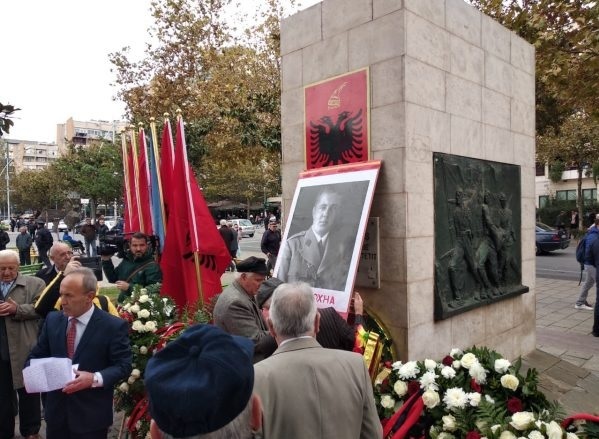 The Communists have paid homage today to the monument of "Unknown Soldier" in downtown Tirana with the picture of the dictator Enver Hoxha, five-pointed star and the communist fist on the occasion of November 17, the day of the liberation of the Albanian capital. After the end of the ceremony organized by the Municipality of Tirana, the nostalgic elders of the dictatorial regime have placed wreaths by honoring with symbols of communism in the middle of Tirana undisturbed by no one. A scandal that occured in the eyes of all institutions when the dictator Hoxha's crimes over hundreds of people have been proven.